How would you like to learn how your sales force is doing – directly from prospective customers? Wouldn’t you like to find out what is going through buyers minds as they sit through the presentations tendered by your sales force? We all know the print marketplace is changing, so print sales people must adapt. How is that working out? Are your salespeople giving customers what they need to encourage them to do business with you? Are you failing to sign business you ought to get? In a new eBook from Gimbel & Associates, printing companies get a rare look into the minds of customers. We asked print buyers to tell us how they perceived the print service representatives that called on them. We wanted to find out what salespeople are doing right and where they need to improve. What we learned may shock you. Typical sales presentations don’t measure up to buyer expectations. The eBook explains exactly what buyers thought during and after real sales presentations from actual printing companies and suggests some better approaches. 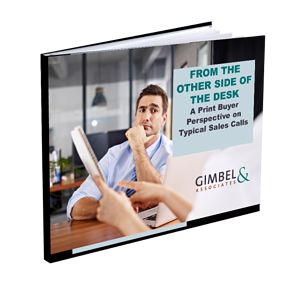 Read this informative eBook before you send your salespeople out on their next call!